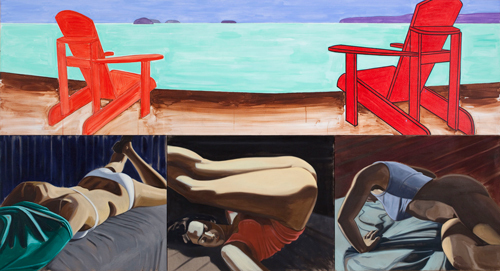 Currently on view at Mary Boone Gallery is New Paintings, an exhibition of new works by David Salle that appropriate anecdotes from the 19th century river scenes of George Caleb Bingham. 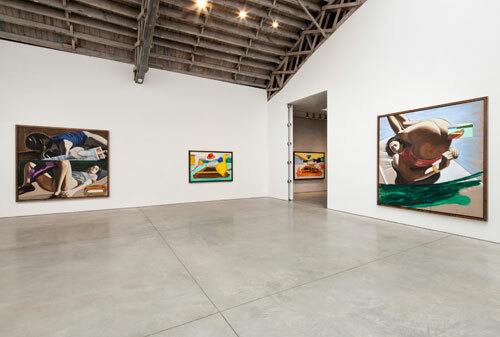 Salle includes a prominent and recurring image of an empty canoe or raft drifting alone amidst quiet waters, with vibrantly colored monochrome Adirondack chairs appearing always empty and face out towards the water as if to appreciate the view. 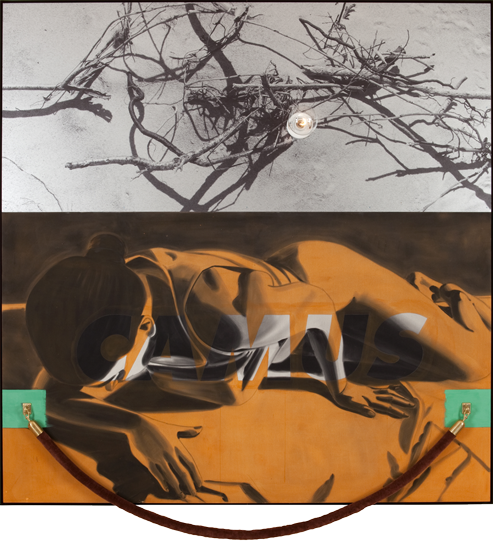 Each work consists of multiple panels, where, along with the rustic imagery, we see the iconic women of Salle’s 1980s paintings. The women struggle to lift their body from the ground in acts of fierce physicality. They are situated on the docks facing the viewer, as opposed the bucolic water views, caught in acts of resistance against unknown forces. These women are the bodily presence that is seemingly missing among the empty hats, chairs, and boats, and despite their presence, the works give off a tone of anxiety and isolation. Vibrant colors, rich brushstrokes and the sheer size of Salle’s paintings imbue these works with energy and life, yet their subject matter reflects an emotional heaviness. Emptiness, stillness, and struggle provide for an intimate and sensitive experience. 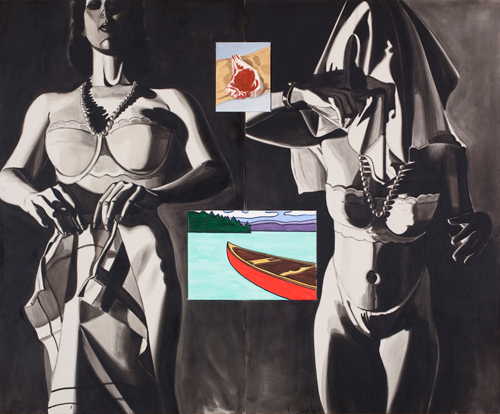 David Salle is an American painter best known for his paintings which mix portraiture and conceptual abstraction. He has had major shows at the Whitney Museum, Los Angeles MoCA, and Guggenheim Bilbao. The show at Mary Boone will close June 25th. This entry was posted on Wednesday, June 22nd, 2011 at 11:49 pm	and is filed under Go See. You can follow any responses to this entry through the RSS 2.0 feed. You can leave a response, or trackback from your own site.